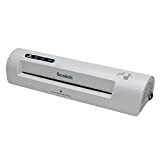 Laminators are a popular tool for crafters, teachers and office workers. Buying the wrong laminator can cause havoc and leave you with low quality documents, while the right one will have your projects laminated quickly and efficiently. 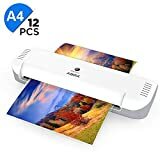 To help you find the very best laminator for you, we have put together this comprehensive laminator buying guide full of shopping tips to make choosing easy. Roll Laminators: Easy to use, roll laminators offer the best value for money. Coming in a variety of fixed sizes that include business card, luggage tag, photo and menu sizes. 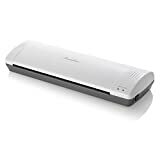 A perfect home laminator for the occasional project. Pouch Laminators: For a bigger variety of projects, pouch laminators are a professional choice for people who plan to do a lot of laminating. Because of their durability and flexibility, pouch laminators are a good choice for businesses and schools or whenever heavy-duty laminated is required. Thermal Laminators: Thermal or hot laminators are the most commonly used laminators and work by melting adhesives of rolls or pouches together. Hot laminating is a durable choice and is ideal for projects that will need to withstand a lot of handling. Cold Laminators: Using pressure sensitive technology, cold laminators are used more frequently for sensitive materials that need protection while laminating. These are fast and efficient and a good choice for laminating those old photos you don’t want damaged by heat. 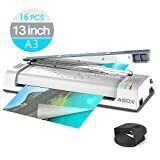 Combination Laminators: Providing the most versatility, combination laminators offer both hot and cold laminating options these laminators will give you the most function for your money. A suitable choice when laminating of a variety of documents daily. Build: Laminators that are lightweight yet sturdy are much more appreciated by their owners. Laminators are often moved around offices, schools, or home and having a unit that is not too heavy and bulky makes it a lot more user-friendly. Operation: Not only do users want their laminators to laminate fast and efficiently but also want their machines to be quick to start-up too. If a unit is quick to warm up it generally gets much higher ratings than those that don’t. Checking online ratings and choosing a top rated laminator will ensure more satisfaction. Variability: Combination laminators are reviewed very well on their versatility as users feel it gives them more options. Another factor contributing to good versatility reviews is the types of document sizes the laminator can handle. Consider what projects you will be doing and then compare it to the model specs to ensure the laminator matches your needs. The first thing to consider when choosing your laminator is how often you will be using it. 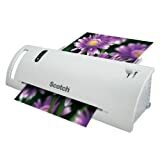 For infrequent use for specific projects, a cheaper roll laminator should be sufficient. For more frequent use on a variety of projects, a pouch laminator will give you more value for money. The wider the laminator is, the wider the projects it will be able to laminate. Laminators also differ in the size and thickness of the laminating rolls or pouches it can handle. Ranging from 3mil suitable for light duty use to 10 mil designed to handle everyday use of a variety of documents, chose one that will suit your needs. 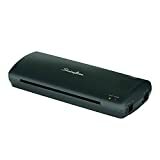 Additional features worth considering when choosing your laminator include: auto-shutoff to prevent overheating, varied temperature settings so that you can adjust per project, an anti-jamming feature that will allow you to remove a jam easily, a reverse function that will let you to take the pouch out and re center when needed, and an easy-access function which makes cleaning, maintenance or removing a jam much easier. Swingline GBC: Since 1925 Swingline has been manufacturing top rated office products including laminators and staplers. 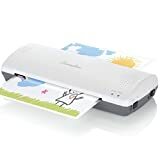 Fellowes: Fellowes is a premium manufacturer of office appliances and accessories that manufacture quality, efficient laminating machines and other products. 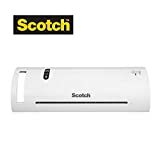 Scotch: A well known stationery brand, Scotch was started in 1939 producing the famous Scotch Tape and have extended their range to include quality office accessories such as laminators.